Shannon Durkin and the Quinnipiac women’s rugby team enjoyed a successful senior day at QU Rugby Field in Hamden on Saturday afternoon, closing out its regular season with a 36-17 victory over the previously undefeated West Chester Golden Rams. Quinnipiac took control over West Chester in the first half. 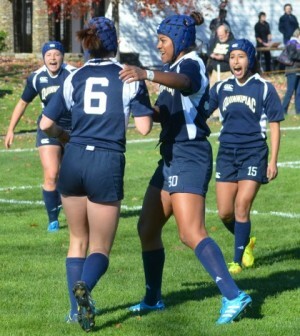 Durkin, a senior, scored 10 points with a pair of tries while Maggie Myles contributed with a try of her own. Quinnipiac led 19-5 at the end of the half. Durkin and Christie Albers opened up the second frame with a try each. West Chester then made a slight comeback trimming the deficit to 14 at one point. Quinnipiac would eventually hold West Chester off, though, earning its fifth win of the season. The Bobcats now headed to the playoffs, as they will compete in the American Collegiate Rugby Association National Tournament. Quinnipiac faces Army, whom it has already beaten, on Saturday, Nov. 15 at Vassar College. With four tries in the win, and 11 in the last two games, Durkin now leads the Bobcats with 16 on the season. Quinnipiac head coach Becky Carlson has been impressed with Durkin’s performance during the season, and is hopeful for similar play in the playoffs. Durkin, Elena Orlando, Elisa Cuellar, Raechel Stimson and Jennifer Salomon were all honored before the game as part of Quinnipiac’s senior day.